Want to understand how language influences the interworkings of the mind? Ask Jake Brodsky ’15, a CC psychology major, who is preparing to present research findings on the topic at an international conference this summer. “His presentation will be viewed by some of the actual researchers he’s cited in his research. Our students can really make an impact on the way people think beyond the CC environment,” said Kevin Holmes, psychology professor, who is working with Brodsky as part of the 10-week Summer Collaborative Research Program. 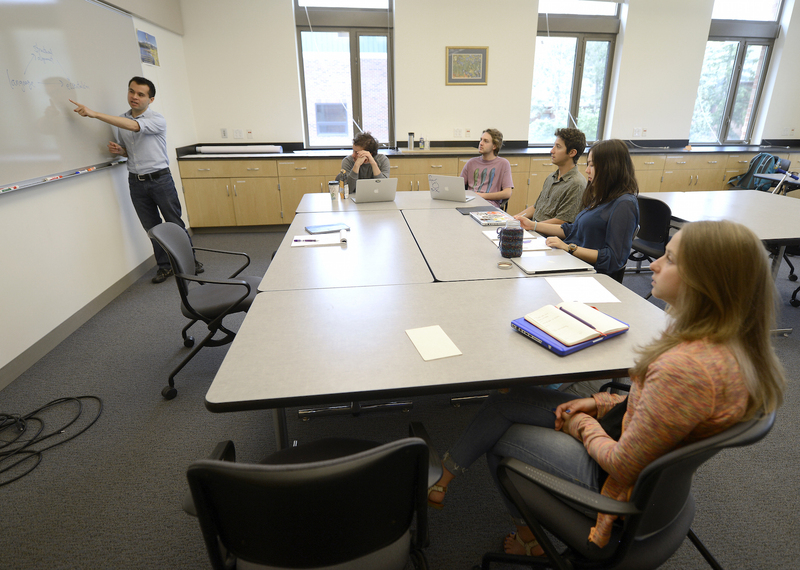 Kevin Holmes, professor of psychology, meets with his team of summer student researchers at a weekly collaborative meeting. This summer, 26 students received funding through the Centennial Fund Faculty Student Collaboration Grant and the Mellon-funded Faculty Student Collaboration Grant. About 65 more, like Brodsky, received funding through other college research awards. The summer program supports faculty members in their research activities and provides students with first-hand research experience as undergraduates. The intent is to expose students to the diverse goals, research methods, and skills faculty use to conduct advanced research in their fields of study, prepare research reports of their findings, and present their conclusions to their peers in classes, at professional meetings, or in Brodsky’s case, to experts in his field. Holmes says participating in this kind of intensive, collaborative research enhances the learning environment for every student. “Doing research teaches you how to think in ways you don’t get in regular classes; just to be able to think through a problem, coming up with a question and determining how to test it,” said Holmes of working with students. Students in the program learn to solve problems, draw conclusions that can be defended, and tell the story of the research, which is what Brodsky is doing now as he prepares to present the significant findings of his research. “You don’t have the pressures that you do during the school year; in the summer, the time is yours, you can sit down and think about the ideas, focus on the theories and the methods, and not worry about the deadlines,” Holmes said. Brodsky’s research and resulting findings grew from his senior thesis project exploring how monolingual and bilingual adults differ in their views of gender. After graduation, he continued his work through funding provided by the collaborative research program. Holmes helped him apply for additional funds, once Brodsky was selected as a presenter at the Cognitive Science Society Conference in Pasadena in July. Holmes is working with six students during the summer and while he says it’s a demanding load, the group dynamic helps the scientific, and learning, process. “Each individual student is outstanding, and bringing them together they learn from and help each other, and challenge each other,” he said. Find out what subject matter other Summer Collaborative Research Program participants explored when they present their work at the second annual Undergraduate Research Symposium held on campus in the fall.